In a blog post, The Future We Need examines whether the Government of India will be the first to treat minerals as as hared inheritance, wealth that future generations have an equal right over. Will India be the first to adopt a 21st century mineral policy? Minerals, natural resources and the commons are a shared inheritance, usually owned by the state as a trustee for the people and especially future generations. It is our duty to ensure future generations inherit at least as much as we did. If we fulfill our duty, we may enjoy the fruits of our inheritance. A loss is a loss to all of us and all our future generations. If we mine and sell our mineral wealth, we must ensure zero loss, ie. capture of the full economic rent (sale price minus cost of extraction, cost including reasonable profit for miner). All the money received from our minerals must be saved in a Permanent Fund like Norway. And only real income (after inflation) from the Fund must only be distributed as a Citizen’s Dividend, a right of ownership. This is palpably fair to all, follows principles of private property and its simplicity makes it feasible and a difficult benchmark to beat. As a political settlement, a large majority should support it. This work started in Goa, India, and is currently most advanced at the national level in India. It is being examined at the World Bank & the IMF, and some countries are examining it as well. In India, the intergenerational equity principle, precautionary principle, polluter pays principle and the public trust doctrine have been ruled part of the core of the Indian Constitution. Reflecting this, there is growing acknowledgement at the national level that minerals are indeed a shared inheritance. In the Goa mining case (Goa Foundation vs Union of India & others), the Supreme Court ordered a cap on iron ore mining in Goa of 20 million tons per annum (“mtpa”), as well as the establishment of a Goa Iron Ore Permanent Fund, financed by a new levy of 10% of the sale value of iron ore. To our knowledge, this is a global judicial precedent. This order was based on the recommendations of an expert committee to whom Goa Foundation had made a representation with these recommendations. The Supreme Court gave the expert committee a year to present a final report. The final report of the expert committee recommended not only the continuation of the Goa Iron Ore Permanent Fund but also the extension of the idea to all iron ore mining in India. It recommended a higher cap of 30 mtpa. In response, the Ministry of Environment, Forests and Climate Change has stated to the Supreme Court that it is in agreement with all the recommendations of the expert committee. In another public interest litigation dealing with illegal iron ore mining in the state of Odisha, the Supreme Court of India discussed Intergenerational Equity and ordered the review of the National Mineral Policy. 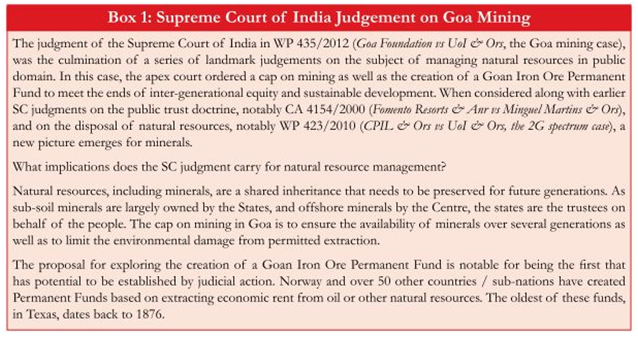 Goa Foundation sent a detailed set of recommendations explaining the constitutional grounds for viewing minerals as a shared inheritance, the rationale for recommending caps, zero loss and zero waste mining, permanent funds and citizen’s dividends, coupled with a wealth protecting control system including fit & proper person tests and radical transparency. Goa Foundation, mines, minerals & People (mm&P, the largest mining CSO alliance in India), Common Cause (the petitioner in the Odisha litigation) and the Goenchi Mati Movement (which advocates these principles in Goa) started a joint campaign. A standard letter was created, which was sent by Oxfam India, MKSS, Aruna Roy, Nikhil Dey and a number of other organizations and individuals. There is a need to understand that natural resources, including minerals, are a shared inheritance where the state is the trustee on behalf of the people to ensure that future generations receive the benefit of inheritance. State Governments will endeavour to ensure that the full value of the extracted minerals is received by the State. However, a disaggregated approach in respect of each mineral requires to be adopted considering aspects like reserves/ resources and potential for reuse through recycling, which are relevant and suitable in the Indian context. An inter-ministerial body with members like MoM, MoES, MoEFCC, States at Ministerial and Secretariat level, may need to be constituted to institutionalise a mechanism for ensuring sustainable mining with adequate concerns for environment and socio-economic issues in the mining areas, and to advise the Government on rates of royalty, dead rent etc. In response, a change.org petition was started, which has over 18,000 signatures so far. The final policy is awaited. There is growing acknowledgement within India that minerals are a shared inheritance. This perspective views mining as the conversion of mineral common wealth into other investments, also a part of the commons. After ensuring the capital is held intact, the income should ideally be distributed equally to all as owners. This growing perspective offers the possibility of a new social contract, one where the people are truly stewards of natural resources for future generations. Can others catch up to India? We are a global movement asking for natural resources to be viewed as a shared inheritance. The Goenchi Mati Movement is advocating these principles for all mining in Goa, India. A joint campaign is asking for these principles to be part of India's National Mineral Policy. Whose Mine Is It Anyway is a campaign to make government finances and national income statistics treat mining as the sale of minerals. This work is based on the practical work of the Goa Foundation.